I have wanted to write this post for quite some time, but things just keep getting in the way. I’ve had a lot of requests over the last couple months about writing about kombucha and I really hope this post helps anyone who is interested in starting to brew their own kombucha. I was SO intimidated at first so that is why I really want to share this beginner’s guide to batch brewing with you today. I wrote about this fermented beverage back in January and covered a lot of the health benefits and history of kombucha, so I’m not going to go into that in this post. 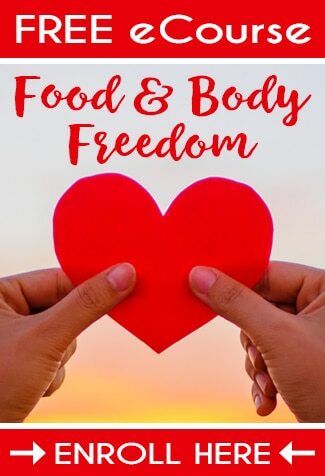 You can check out this post from Kombucha Kamp for more in-depth reading about kombucha health benefits. As a reminder, SCOBY stands for Symbiotic Colony of Bacteria and Yeast. Like kefir and other fermented/cultured foods, kombucha is a great source of beneficial bacteria that help heal and maintain our gut. I always say, if your gut’s not healthy, then you’re not healthy. Brewing kombucha is SO easy! It can be intimidating at first, but let me tell you – there is no reason to be intimidated. It’s simple and FUN! I love brewing it now and I wish I had started brewing it earlier in my life. I think about all the money I could have saved (since booch is now a minimum of $4.00 a bottle). So, let’s get started. In this post, we are specifically covering batch brewing. You may hear me refer to batch brewing and continuous brewing for kombucha around this site. They are two completely different methods, each with their own pros and cons, but there is no right or wrong way to brew your own booch. I say go with whatever method appeals most to you. I personally love both methods and was a prolific batch brewer before I gave continuous brewing a try. To be 100% honest, I prefer batch brewing. I think it’s because batch brewing is how I started out and I have a deep connection to the process. 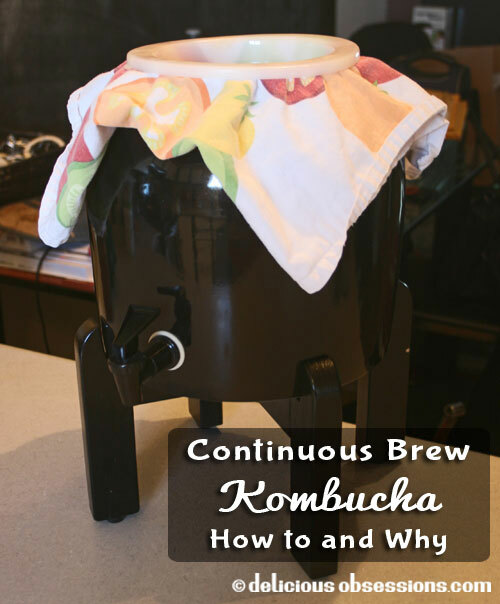 If you want to learn more about batch brewing, please read Continuous Kombucha Brewing: How To and Why. Before we can start brewing, we need to gather some supplies. I have outlined everything you need in this post to successfully batch brew your kombucha. Note on Tea Bags: I personally don’t like using tea bags but will if they are all I have. There has been some evidence of chemicals being used in the bags themselves. I also have read that sometimes wheat is used in the glue that seals the tea bags together, making them a risk for those with gluten allergies. I personally prefer loose leaf organic tea and would recommend that if at all possible. You can find a bunch of loose leaf organic black teas here. OK – Now that you have gathered your supplies, it’s time to brew your first batch. Getting started is so easy. Yay! Let’s go! First and foremost, DO NOT wash any of your kombucha brewing supplies with soap!!!!!!!! Soap residue can often kill the bacteria and yeasts in the SCOBY and will render it useless. To sanitize your supplies, you can use hot water and then rinse thoroughly with white vinegar. Be careful when washing your glass items with hot water to avoid breaking. I boil mine in water and I have had no problems so far (knock on wood) with boiling my bottles and jars, but please do use extreme caution if you choose to do this. Just because I haven’t had any problems doesn’t mean accidents can’t happen. Don’t use tap water – the chlorine will kill the SCOBY. Filtered water only! This recipe is for one gallon. I find this to be a manageable amount for my family, but if you know you will drink more than that then you can easily double, triple, or even quadruple your batches. You will just need additional ingredients and brewing vessels. 2. Heat 1 quart of water. Place your tea in your brewing vessel and add the hot water. Brew your tea for about 10 minutes and then remove the tea bags or leaves. Add your sugar and stir or swirl around until dissolved. Add 2 more quarts of cold, filtered water and test the temperature. You need the mixture to be room temperature. NEVER add your SCOBY to water that is too hot. It will kill it! 3. Once the liquid has cooled, you can now add your SCOBY. But first, you need to sanitize your hands. That way any bad bacteria that might be on your hands will not be transferred to the SCOBY. To do this, rinse your hands in distilled vinegar and shake off (I don’t dry them because I don’t want to risk contaminating them). Now, you can handle your SCOBY. 4. Take the SCOBY and place in your brewing vessel with the cooled tea and sugar mixture. Pour 1 cup of the starter liquid (or vinegar) in and fill the rest with filtered water, leaving an inch or two at the top. 5. Cover with your tight weaved cloth and secure with a rubber band. Move to a warm, quiet place where it won’t be disturbed. Now it’s time to let the SCOBY work its magic. I know it’s hard, but you have to walk away and leave it alone. Don’t mess with the vessel during the initial brewing period. 6. Typically brewing time is 7-14 days. The amount of time depends a lot on the temperature of your house and the taste that you prefer. After 7 days, take a straw and taste a little of the kombucha. If it’s too sweet, then you need to let it go longer. If it tastes vinegary or tart, you can reduce the brewing time next time. It’s important to remember that it will take a few batches for your SCOBY to get up and running at full strength. So, don’t get discouraged if your first couple batches don’t taste quite right. Now comes the fun part! Creating magical flavor combinations to tickle your taste buds. Once your kombucha has reached a flavor that satisfies you, you can either drink it as is, or you can bottle it up with some flavorings and do a second fermentation. Before we get started with our second ferment and flavoring magic, let’s gather the supplies you need for this process. Remove the SCOBYs from the brewed kombucha and set aside. You should have two SCOBYs now – your original one and the new one that formed during this brew. Reserve 1 cup of brewed kombucha as your starter liquid for your next batch. Insert your funnel into your jar(s) and pour or scoop the brewed kombucha in. Fill your jars to the top for increased carbonation. The flip-top bottles seem to yield much fizzier results than any other style bottle that I’ve tried. Put the tops on and place in a dark, warm place where they can ferment undisturbed for 3-5 days. If you fill your bottles super full, you will need to burp them daily to help release some of the carbonation. I’ve read of people whose bottles have exploded and injured them, though this has never happened to me. Just use caution with this step. I store mine in my pantry in a cardboard box with a towel over it, just in case. Once the second fermentation time is done, move the bottles to the fridge to slow down the fermentation and build up of carbonation. There are no firm recipes or rules when it comes to flavoring kombucha. You can use any fruit (fresh, frozen, or dried) or fruit juice that you’d like. For my 20 ounce bottles, I typically use around 2 tablespoons of fruit juice and/or about 1/8th of a cup of fresh or dried fruit. I really never measure it out, so the “recipes” are just general guidelines. To increase fermentation and fizziness, you can add a pinch of sugar into the bottle before the second fermentation. I created a water kefir flavor guide which has a ton of flavor combo ideas that you can easily use for your kombucha. You can read my Water Kefir Flavor Guide here. These are just a few of my favorite combinations. Anytime I use fruit (frozen or fresh), I mash it up, which not only helps it fit in the bottle but also helps it release more flavor during fermentation. You really can use any combination of fruit you want. You can also use herbs and flowers to flavor your kombucha, though hubby and I haven’t branched off in that direction yet, as we are still hooked on the fruit flavors. You’ve Bottled Your First Batch – Now What? Once you have your bottles prepared and stored, you can start another batch of kombucha. Simply repeat the steps above for Brewing Your First Batch of Kombucha. So far, I brew about two to three gallons per month. My rotation seems to work pretty well. It’s just two of us drinking it, so any more than that, and I’d run out of bottles and space to store! Never use soap on any of your brewing equipment. Never use tap water – chlorine kills the SCOBY. Always sanitize your equipment and hands with hot water and/or white vinegar. Always reserve 1-2 cups of brewed kombucha for your starter liquid in a new batch. NEVER put your SCOBY in water that is too hot! Wait for your liquid to cool to room temperature. Don’t disturb your brewing vessel during the first 7 days of brewing. One thing you will notice after awhile is that you will have SCOBYs building up. For each batch that you brew, you will create a new SCOBY. There are several things you can do with them. Share with your friends and family – this is one of the most fascinating things about cultures is that you can share them with others and they travel around the country! For example, my very first culture came from a friend in New Mexico and it was from a culture that was many, many years old. Use them for test brews with different types of tea and even coffee. I’ve never brewed with coffee, but I have heard it works well. Feed them to your dogs. Dogs need beneficial bacteria too. I don’t recommend giving them a ton at a time to start, but a small slice would be a good treat, assuming your dog would eat it. You can pour brewed kombucha on their food. You can also dehydrate them and use them as “rawhide” treats. Create a SCOBY hotel (see pic below). I have done this and now I have extras should an emergency arise like mold or fruit fly infestation. Stick them in your compost. Blend it up in a food processor and use on your skin. It will increase circulation and help renew and exfoliate skin cells. Your skin might be a little red after the application. Let it sit on your skin for a few minutes and then gently wipe or rinse off. Always test a small section of skin first for sensitivity. You can also just lay the culture on your face. Use them on wounds, boils, cuts, etc. I have heard of SCOBYs referred to as “living band-aids”. So awesome! Applying strips of the SCOBY to wounds can help spread the healing and prevent infection. So, are you ready to start brewing your own kombucha tea? I hope that this guide has been helpful and that you will give it a try! I can’t wait to hear your feedback and comments, so tell me what’s on your mind! If you’re interested in learning about the Continuous Brewing method to make kombucha, check out this post that I wrote. 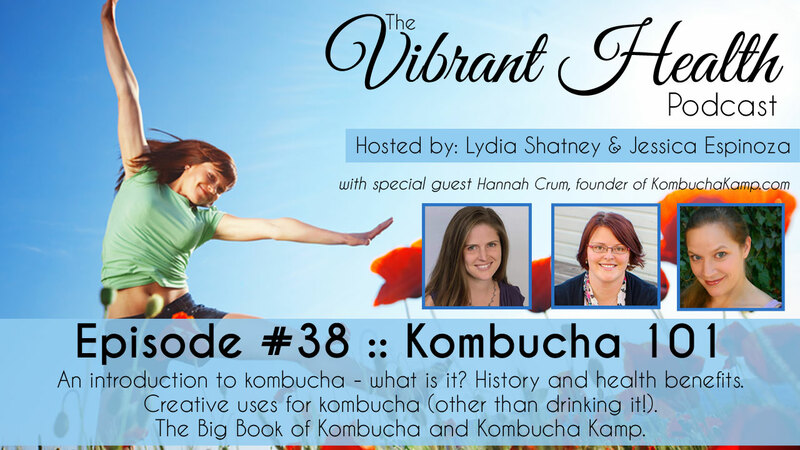 My favorite kombucha guru, Hannah Crum, is releasing an AMAZING new book (March 2016) called The Big Book of Kombucha: Brewing, Flavoring, and Enjoying the Health Benefits of Fermented Tea. 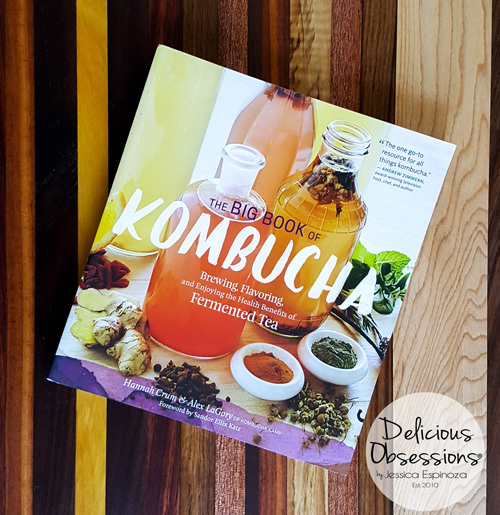 This book is an amazing resource for anyone who loves kombucha, whether you are new to brewing or a seasoned expert. Everything you need to know about brewing, flavoring, bottling, troubleshooting, etc. will be covered! Order it on Amazon here. You can also check out my review of this awesome new book + get a super tasty kombucha and kale smoothie recipe here. Excellent article! I bet your KT is super yum. I love how pretty the fruit looks in the bottles. HAHAHA! Laughed myself into a rib cramp picturing ” You can also just lay the culture on your face.” Great article Jessica! 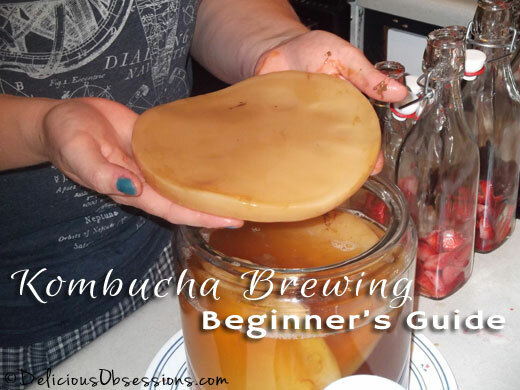 and this is a super way to grow your own SCOBY from store-bought kombucha, instead of paying upto $20 to buy one…. i have used this successfully many times! I’ve had a SCOBY with some of the KT in my fridge in a sealed bag for several months now. I bought it quite awhile ago but have been too intimidated to make the tea and haven’t done anything with it. It’s still the way it came when I ordered it. Would it still be safe to use? Hi Crissy – Thanks for the question. I don’t know if it would still be alive. I have been told that you’re never supposed to store scobys in plastic. If it’s been sealed up for an extended period of time, there’s a chance that it may have ran out of food (sugar) to eat and may have died. To test it out, I would brew a small batch of sugar tea and toss it in there (pour in the KT that you have in the bag with it. if it is still alive, this might help get it going). Just cover it with a tea towel and leave it alone for 2-3 weeks and see if it cultures, or at least starts to culture. Sometimes when they’ve been refrigerated, they go into hibernation, so it could take it awhile to wake up and start producing. You will know that it’s working if it starts to smell vinegary and you don’t get any mold. 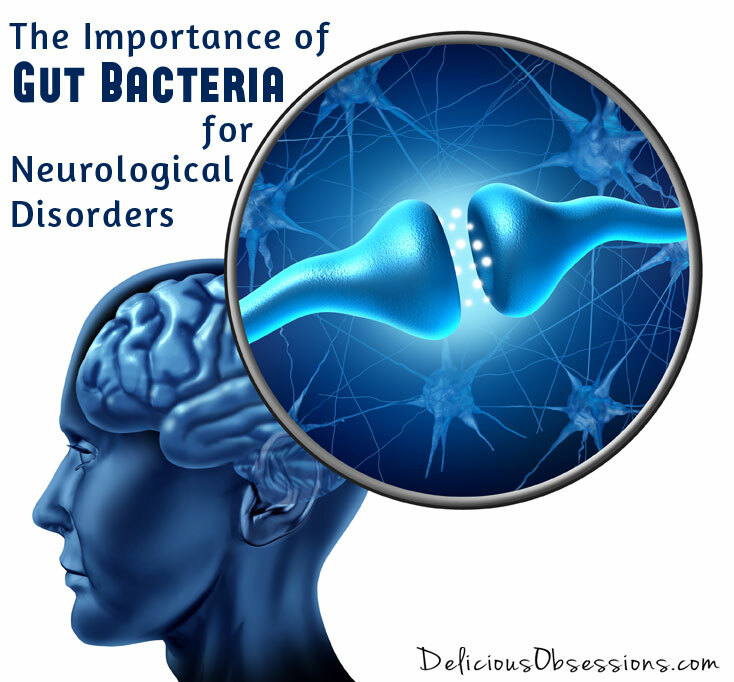 If the culture is alive and active, the good bacteria will fight off anything bad that would try to grow. You might leave it up to a month and see what happens. I too received a SCOBY from a friend in a ziplock bag and left it in the fridge for almost a month before I used it. It didn’t look promising. But, I used it and all the juice in the bag to make a batch and after two weeks a new SCOBY had grown and looked amazing. I tossed that batch of tea and started anew. Viola! I googled images of different SCOBYS so I would know normal from abnormal. What I started with didn’t look perfect but it wasn’t moldy. You’ll know if it’s dead even after a week because you won’t see any improve the in how it looks (aka new growth). I brew Kombucha and the whole family loves it! However, I learned a few things in your article! For one, I had never thought of all those uses for my extra SCOBYs! How great! I enjoyed article, I have a few tips of my own for you. Organic tea and organic sugar can actually carry contaminates. Using regular black tea and plain white sugar is a consistant product producing consistant results. Using very filtered water over a long period of time can kill the scoby as it receives no minerals. Actually boiling tap water for 5-10 minutes rids it’self of the chlorine and feeds the scoby too. I use 1/2 mixture tap and filtered. Using green tea,or a combination of these two straight teas is a good taste. I am a first time brewer. It’s only day 3 and I have black stuff growing on the top. What should I do? What did I do wrong? Lori, it sounds like it could be mold. Could you send me a picture of it? You can email me here: deliciousobsessions@gmail.com. If it is mold, then you need to throw it all away, even the scoby, or else it could continue to contaminate future batches. But, in all the time I’ve been brewing, I’ve only known of a few actual mold cases, so maybe it’s not. Would love to see a pic. I just received my starter scoby. Hoping to get started on it on Monday. Love your recipe ideas – I will have to try some of those! Hi. Thanks for all of the info. I’m in the process of growing my own SCOBY right now and I think it’s ready to use, but I noticed today that there is a fruit fly in the jar (which I don’t get how it got there, but it’s there). If I just kill the fruit fly, is it okay to still use the SCOBY. I’d hate to throw it out because it took so long to grow (we haven’t turned our heat on yet, so our house is a little cool). I only see the one right now, not an infestation, but I know that where there’s one, there will soon be many. Thanks for you help! Hi Heather – That is a tough call. I had a fruit fly infestation earlier this year and my scobys did get contaminated and I had to throw them out. It makes me nervous when one was in the jar — they lay eggs so fast and where there is one, there is often more. But, at the same time, I don’t want to advise you to throw them out, because they could be fine. You know what I would recommend? Have you heard of Kombucha Kamp? My friend Hannah is the kombucha guru and I’m sure that she would be able to advise you best. Check out their site here: http://www.kombuchakamp.com/11040.html. I am sorry I’m not more help. This is an area that I always waver on!! HELP!! I have been putting extra SCOBYS in the refrigerator…have I ruined them??! 🙁 They look fine and still make a vinegary-tasting brew, but I’ve also read that that isn’t always an indicator of how healthy they are. How can you tell if they are OK? Thanks for answering and for the detailed information for a beginner! Thank you for this post! I got my first SCOBY last week and I finally got around to making my first batch of Kombucha, I was looking for a good beginner’s post and I finally found one, your’s! We shall see what happens in 7-14 days. 😀 My SCOBY came from a friend, which came from another mutual friend in another state. Hello! I found you on Pinterest. I used to brew my own a while back, but being the only one drinking it, I ended up having way to much! It never occurred to me to make smaller batches. (Duh!) You have motivated me to start again. First, I need to get a Scoby. I do have one question for you though…how long can I keep the Scoby in the starter before I need to start a new batch? Can’t wait to start drinking again! Jess, thanks for the quick answer! You answered my question for the most part, but I have one left. Where do you store the “hotel”? I’m pretty sure that it’s covered with a tea towel, or cloth, correct? I just ordered my Scooby and hopefully it will be here in 5 days, give or take. I miss drinking it! My favorite flavors are lemon ginger, and grape, cranberry is pretty good too. Thanks Jessica, that’s good info. Now I just wait for my scoby. I have a continuous brewing system & I’ll clean it up & be ready. This time I’m only going to make 1/2 gallon. Hi There! Your article was really great! I started brewing my own Kombucha after falling in love with it at my local store, but not falling in love with the price. LOL! My main question is, does the carbonation start once you put it in the fridge? Because I’m fermenting a batch now, and it’s not really bubbling up. Any ideas? My house temp is at a constant 75 and the SCOBY is growing and doing its job. No mold. Nothing. Thank You! I’m new to kombucha brewing, just made my first batch. (I have been brewing my own water kefir for a few weeks now and love it), but the kombucha seems to taste a little sour. Is it because of the first batch being brewed with vinegar or did I do something wrong? Hi Yvette – Kombucha will naturally have a sour taste, especially if it’s been brewed a little too long. I’m confused by what you mean when you say “brewed with vinegar”? Vinegar should only be used for cleaning and sanitizing the vessel, not for the actual brew. Does that help? as far as the vinegar – it’s right there in the instructions: 4. Take the SCOBY and place in your brewing vessel with the cooled tea and sugar mixture. Pour 1 cup of the starter liquid (or vinegar) in and fill the rest with filtered water, leaving an inch or two at the top…. Ok, done with my second batch, and yes it tastes much better when you make it with starter tea v/s the vinegar…. One more question – what do you do with the baby scoby? Last time I used it to make another batch, so I made 2 batches this time, one with the original mother and one with the baby. The batch made with the baby, made another baby, but it’s very thin and seems small.. If the baby is kind of small, can I put it in with it’s mother to brew a batch and will it grow bigger when it’s sitting in another batch? Otherwise, I have read about the Kombucha hotel and storing them in there, but will they continue to grow there? Also a question about caffeine. I seem to get effected quite significantly by caffeine so am trying to avoid it. If I were to brew with white tea would this significantly reduce the caffeine content? Would you advise using a blend for the SCOBY’s sake (eg mainly white plus some green plus a little black) or could I use purely white? Any advice would be much appreciated. I admire the care you clearly take over your kombucha! Hi Hu – Thanks for stopping by! Just a quick note that unlike most other ferments, kombucha requires oxygen, so you don’t ever want to brew it in one of your airlock vessels. So, for the initial ferment of the kombucha, you want to just cover the jar with a towel. For the second ferment, you can pour off the tea and do your 2nd ferment. I recommend the flip-top style bottles, which will yield the best amount of fizz. Just make sure you leave plenty of headroom, as the pressure can build up fast. When it comes to using green and white teas for kombucha, the experts I have spoken with recommend alternating batches with straight black tea. The scoby does need a fair amount of caffeine for its overall “diet”. I have also been told that most of the caffeine is used up by the time you get to the final brew, though I do not have any idea what the actual percentages would be. If you use purely green or white, you will need to alternate batches with straight black tea. A blend of the green/white with the black might be a better bet and would ensure the scoby does get some caffeine for nourishment. Hope that helps! 🙂 P.S. The Kombucha Kamp site that I link to in the post has TONS of info, FAQs, etc., so I highly recommend it for a resource! I have a well, so no chlorine is added to my water. I do know that our water is pretty hard and has iron in it. Is it still okay to use my water? I love this website, but I am concerned, I have just brewing my first batch of kombucha tea, but I steralized my jars with hot soapy water and rinsed with boiling water, and I also added a tea for flavour that has ginger in it. Have I ruined my batch or even worse have I diminished the use of my scoby? I did not have the information on steralizing equipment before I started my brew. Please help me know what to do. Regards Angela. This post helped me make my very first batch of kombucha today. I’m a little worried though. I thought my tea was room temperature, but realized it was slightly warm after I put the scoby in. Do you think I ruined it before it even had a chance to begin? Thanks! Hi – this is my first look at how to brew KT and you make it sound ALMOST doable! I may give it a shot, but I’m wondering: do you think I could recycle the Kombucha jars from my store bought KT? I have a LOT of them (GT’s Organic), hence the “I need to figure out how to make this instead of spend a fortune each week” reason I stumbled upon your post. I have never used alka water, but I think it should work fine. I am not 100% sure though. I am new at doing this and am planning on starting my first batch this week. I have a really good glass container to use for this but it is a 2 gallon container… I definitely plan to only make a gallon in the beginning and I may even go down to 1/2 a gallon. Would there be any problem with using a huge container like that and just having all that extra room in it? Thanks! Hi Isabel – I think that would be fine. I think once you’re comfortable with making it, you will find you need 2 gallons. 😉 Happy brewing!!!! How do you separate the SCOBY and how do you store it in between batches. If refrigerated and in dormant state, what is the process of making it useable again? Can you cut a SCOBY if it gets too big? Thanks for your time and your article. I am excited to start brewing my own and experimenting. I am anxious for my kids to try it! Hi. I grew my scoby & started my first batch. Just wanted to make sure I am doing this right. Once the batch is done, I bottle it & save at least a cup from that batch & I can start on my next batch using the same scoby? Informative article – thanks for writing it. I have been brewing kombucha for more than a year now and I have learned a few things in the process – tea extract should be at least 50% black tea! I use a 2.5 gal urn with a tap at the bottom for easy bottling and for it I take 12 organic black tea bags, 6 organic green tea bags and 6 organic white tea bags and 6 cups sugar. I also brew a coffee kombucha (which I love) in a gal urn, also with a bottom tap. I brew 2, 12 cup carafes of coffee, add 3 cups sugar and when cool, pour into the urn then add water to fill it. Leaving at least a cup from the previous brew is still needed but the scobies should be replaced after a few brews and the old ones should be discarded. A new scobie does not grow in the coffee kombucha. I also do a second ferment with both the tea and coffee and I have found the simplest way is to add a level quarter tsp of sugar to each bottle then seal it. The coffee kombucha should not be flavored, just add the small amount of sugar per bottle for the second ferment. With the tea kombucha, sometimes I cut up a half inch cube (approx) of crystalized ginger and add that to each bottle. Also the coffee kombucha can get overly fizzy, so care needs to be used in opening the bottles. Your flavorings sound really good and I will try some of them out! The coffee ferments a little quicker, usually in about 6 days compared to the tea which varies from 7 to 8 days, in my house. I leave the second ferment out until I am ready to do the next batch and then I refrigerate the bottles. Yes, that’s a lot of kombucha but other than water, it is the only thing we drink now. My husband and I have one coffee kombucha and two teas each day and the cost of six bottles on a daily basis would be high – which is why I started brewing my own! Hi – I was brewing kombucha earlier last year and had great success and loved it! However I discovered through trial and error that it was causing me to have excessive “wind”! I was only sampling shots of around 30ml per day as that is what I read to do in the beginning but it just didn’t seem to agree with me. I have terrible gut issues and was hoping kombucha would help and am now too scared to try fermenting my own veggies for the same reason. Can you offer any advice? I am just starting my first batch of Kombucha… and I noticed that your recipe is the only one that I have found that doesn’t mention that I need to purchase a bottle of Kombucha as one of the first main ingredients… Why is this? I’m sorry, I am confused and don’t want to do it wrong! Hi Jenny – People are probably using the bottled kombucha as a starter for their brew. You technically don’t need it if you have a healthy scoby, but it does speed up the process to use some starter with you very first batch. When you received your scoby (either from a store or a friend) it should have come with some starter liquid. If it didn’t, you could try using some bottled kombucha as starter, though I have never tried that. I don’t see why it wouldn’t work though. I made my first batch of kombucha and after a week of being stored in a cabinet, I noticed that my scoby was at the bottom of the container and not floating at the top as I’ve seen when doing research on making kombucha. Is this batch good? Hi Jessica. Please can you help. I have gone about making Kombucha tea completely back to front, but want to get this right. I received a Scoby and made it with Red bush tea as I could not get Kombucha tea. The Red bush tea fermented for 8 days and have now put it into the fridge. However I finally have obtained Kombucha tea and have added this to the brew in the fridge. Do I have to re-ferment again or would it be ready to drink as it is? I made this back in the 80’s , it has been a while. I made my tea and it is almost black, do I need to water this down? This is my first batch. Thanks in advance. Do you know if extra scobys can be fed to animals, like chickens or rabbits? Will it be as good for them as it is for us? Hi Tammy – Yes! I know some people who dehydrate them and feed them to their dogs (my dogs are not a fan though). I have also heard of folks tossing them out to their chickens and letting them peck at it. I wouldn’t go overboard and feed them a ton at once, but a little here and there should be OK.
After years of thinking about it, I am finally ready to start making our kombucha. Then this popped up today! Thanks for the great step by step and background info. 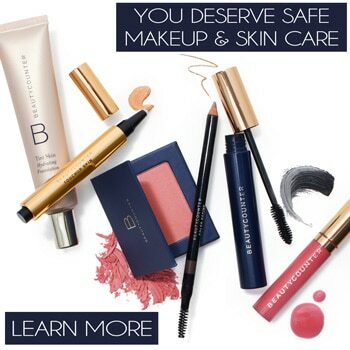 Jessica, I love your site and am always inspired by what you share. Thank you! I have a newbie question – I use cloth covers for my batch brew kombucha. Should I replace with clean cloth every week (on a 7-day brewing cycle). Is it okay to wash and reuse covers? or reused covers for more than a week? And I just got enough scobys to start a hotel – how often should I replace that cloth cover? Thanks a bunch!! I made a batch of kombucha and accidentally added the ginger tea mix to the batch that is fermenting. Both batches grew new babies that seem healthy. Not sure if I introduced something that shouldn’t be in there by adding the ginger tea during the wrong part of the process. Normally, I would add it right before bottling but I got confused this time. Should I bottle this up and add more ginger tea and use the scoby to grow a new baby? Should I toss the babies or just go with this and see what happens? Hi Lisa – I am not sure why he would be storing it on the stove. My guess is that he is hoping the pilot light would offer some warmth for the brew? I’d suggest putting a large plate or tray under the jar of kombucha to catch any liquid that might be bubbling over. I’m just wondering if I can put my brew next to the microwave, or will it affect my scoby? Hi DeAnna – That is a great question, and I am not really sure. My initial thought is that it could disturb the scoby and ferment though. I am looking for a starter scoby. I live in Council Bluffs, IA. Does anyone out there have some or where can I buy it? If you don’t want to spend the extra money required to buy a scoby you should consider growing your own scoby. The process is very simple and will only cost you a couple dollars. 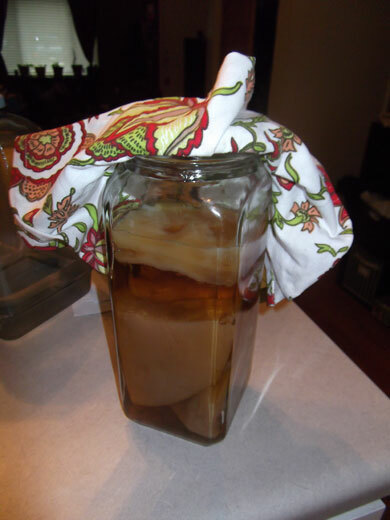 When I grew my scoby I followed the instructions on the website http://www.createitathome.com/?p=15. Best of luck! From my experience, if you can see a small scoby in the bottle at the store you should be able to grow a new scoby from it. I typically see a small scoby in GT’s kombucha. Just feed it sugar and put it in a favorable environment and it should start growing. It does grow quite slowly though. I believe it took about a month before my scoby was large enough to brew with. That being said, I have been able to grow a scoby every time with GT’s, even since they changed the formulation. Then again, I’m a microbiologist by day and kombucha brewer by night. I’m about to embark on my first kombucha-brewing experience, and your site has been very informative! I’m concerned with the possibility of exploding glass bottles, so how soon after bottling should I begin to burp my bottles? Thanks! Hi, I am starting my first batch right now. After I brew the tea and put it in my vessel, do I leave the tea (loose leaf) in the vessel with the Scoby for the first round of fermentation?? Question how long will the kombucha stay good in the refrigerator & does your answer apply to 1st & 2nd ferments or do they last a different amount of time. Thanks in advance. P.S. Andrew Zimmerman show “Bizarre Foods” recently had a segment on kambucha you might want to find it & see what they do with their SCOBY’s. Just thought you’d like to know that I found some kombucha in my outside fridge that is over a year old and it is absolutely delicious. I’m using it to see if I can start a new batch. THank you soo much for this!! I always bump into a diy that is only partially informative but you have explained Everything in clear and easy to understand detail! I am Super grateful for the time you spent writing this! Oh awesome! So glad it was helpful!! 🙂 Happy fermenting! A most informative article. Thank you. I feel more prepared to make my batches of kombucha tea . Hi! thanks for all this great info, especially the recipes! I can’t wait to try them! I just got a SCOBY from a friend, along with a cup of the starter liquid. I made tea yesterday with 5 black tea bags and 4 cups water, adding cooled filtered water to it as well to fill up a 1 gallon jar, I added a cup of sugar and after it was cooled, I added the SCOBY. My questions are: do I need to wait for 7 days? My friend said she waits 4 before moving the brew to smaller jars with fruit juice. I think she adds just 1/2 cup sugar to her starter though. I guess, I’m just worried I’m going to mess it up. Thanks so much! I have been making kombucha for a while now (almost a year) and i don’t believe my scoby has has never gotten as thick as you show in your images. They tend to tear a lot and separate and stay fairly thin. Any ideas or suggestions? I just managed to grow 3 little Scoby’s in a store bought bottle of organic Kombucha. The bottle had about 1/2 cup of liquid left in it and I left it for a couple of months. My question is, now that I have my Scoby’s, can I use organic apple cider vinegar (with mother) instead of the distilled vinegar in the recipe above? Hi Jade – You only use the vinegar as a sanitizer. ACV does not have as low a pH as white vinegar (more germ killing power), which is why white vinegar is typically used. Dear helpful reader, please help. I successfully brewed several batches of kombucha, now suddenely half the last batch and this entire batch (4 gallons), has a green mould on top. I am pretty sure from alll online advice that this shoulsd all be thrown away. But I need to know what I am doing wrong. Is it possible that the tea is unsuitable i.e. has mould on it? I read, when followining an anti candida diet that this can be the case with some teas. What tea would you therefore recommend please? Hello there! So, I used your instructions but I think I put a bit too much vinegar. So right now, it just tastes like vinegar! Is there anything I can do with it or should I just take the scoby out and start a new batch? Thank you! I have just found you new to pintrest also. I have a question and you seem to be the one to ask. I started my mushroom, got really sick, wound up in hospital..whole on me yards. Anyway, kinda forgot about my mushroom, but began cling from time to time. Because of the paper towel covering my jar I didn’t notice my ‘baby’ until it is now a huge monster! Way bigger than the ‘moma’. So my question is, is it still OK, just as potent, and did you write in your recipe that I should use a little of the original tea for my new batch? Even if it’s very vinegar-y? Sorry this is so long, I’m new to all this and trying very hard to be healthy. Hi! Thank you for responding so fast! I have noticed on the very top of my monster baby is a very thin new baby. I’m so excited! But….do I let that one get a little bigger, or go ahead and make a new batch of tea from it now? Thank you again for your time and info. Thank you again. I’m working now on sanitizing a bigger jar to try to start a hotel as there are two new babies! I do plan on giving most away to family. My biggest hope is that these mushrooms will help with my chronic pain and I have heard amazing stories, so super excited to give ’em a go. Problem I’m having now is finding jars with wide enough mouth, any suggestions on that? You have been so helhelpful and I really do appreciate you so much. Oh no Jessica! I’m in the middle of making my first batch of tea and just realized I don’t know if I’m supposed to use the original ‘mother’ for the tea, or will that one always stay in the jar to make more babies? Grrr, can’t believe I didn’t think to ask that and I’m trying to read as much info as I can, just so much. Also, the original is much darker, I just figure bcs it’s more mature?.?. Andl,my kitchen is “tore up”, hopefully with time that will get better too, ha! So sorry to keep bugging you, but really happy you are willing to help people. Thank you once again, and you thank you for the other address. Just wanted to let you know that when I went to put my brewed tea in the fridge, there was something weird looking on top, I thought possibly mold, went to scoop it out to see what the ‘problem’was, and it was another thin little baby! So I was gonna put it in the jar with all the others, and there was another new baby on top of that jar also! Babies every where! I was so worried about being able to make the first one and now I guess I have a hotel…crazy. So I put the one I made my brew from back w/ the rest, is that the thing to do? So very excited to see if this is going to do anything for my chronic pain and chronic fatigue. I know it won’t happen over night, but after 15yrs of this I will certainly give this an honest shot! Thank you for giving me your time in this effort. Thank you so much for the well wishes. I can truly tell anyone that you don’t know how lucky,blessed you are if you have your health. I always had been and also very active, next thing I know I was bedridden, hospitalized several times, had to quit my Job…. the whole 9 yards, so yes, I have much hope in this tea. I will certainly check into the Weston A Price foundation. Never heard of it, but if it will be of help I’m all for it. You helped me, so gotta pay it forward, yeah? Thank you again for all your help, especially bcs I know I’m not the only one, by far, so for taking so much of your time with me is sincerely appreciated. I started on my tea and a couple days later I became very nauseated, isn’t unusual for me, but I layed off the tea for a few days, now I’m wondering does, or can the tea become cloudy like regular tea, and if so what should I do? Regular tea says if this happens to reheat the tea to boiling point, but I’m afraid that will hurt the effectiveness. What do you think? I sure don’t want to pour it out. Thank you in advance and hope you are doing wonderful!!!! ? Hi Jessica. This is a great article on brewing kumbucha. Thanks so much! I have my second batch brewing and I just finished reading “The Big Book of Kumbucha”. I didn’t know that you should use black or green tea vs flavored teas. I used Stash Green Ginger only. Will my batch be ok? Can I use the scoby again with black or geeen tea to strengthen it next time? I don’t see any mold. Could apple cider vinager be use instead of white vinager also honey in place of sugar? Hi Stedson – Yes, you could use raw apple cider vinegar if preferred. Yes, you can use honey, however, you will want to avoid raw honey as it does contain its own colony of bacteria that could adversely affect the culture. To use honey, substitute 7/8 of a cup of honey for every 1 cup of sugar. I would encourage you to look into Jun, which is similar to kombucha but historically is made with honey and not sugar. It’s a slightly different culture of bacteria. Happy fermenting! So unfortunately I read this after I started my first batch… But I washed my glass brewing jar with soap beforehand. It’s a natural, non-toxic soap. But soap nonetheless. I rinsed it several times with hot water before using it and I’m positive there was no soap left in the jar. Have I ruined my scoby? Hi. I successfully made my first batch of kumbucha. I have a couple questions I can’t find online. 1- after 2nd fermentation should I remove fruit? I put blueberries and ginger in and they’ve been formenti for about 5 days. Will the fruit spoil? 2- how long can I reuse the same scoby? I’m on my second batch with the original scoby. 1. It is totally up to you if you want to remove the fruit after the second ferment. Some people choose to remove it, some people leave it in. 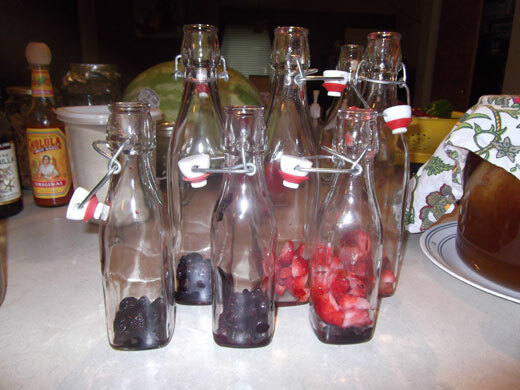 I personally always left it in because I did not want to open the bottle and lose all the wonderful carbonation just to remove the fruit. The fruit is not going to spoil, but it will keep fermenting so the longer the beverage sits, the more alcohol will develop. Ideally, you will do as second ferment for 12-24 hours and then move to cold storage to slow down the fermentation process and preserve the beverage. depending where you live, some cities use chloramine, which wont boil off very much. better to buy some reverse osmosis water, then add pinch of salt to remineralize the water. Hi Joe! That is very true! I need to update the post with that note. Thanks for taking the time to stop by! This is one of the best articles I have read on brewing kombucha! So thank you so much for sharing! I do have a question, however…I have been brewing my own kombucha for just a few months now, and at first it was perfect! But lately, it has not had any effervescence, and I do not understand why. The flavor is great, and there is pressure build up in the bottles, but no effervescence..do you by chance know what the issue might be? Also, how do I know if I have “killed” my SCOBYs? Hi Jessica! Thanks for stopping by and for the kind words! Woot! You made my day! 🙂 That is weird that there is pressure building up but the fizz is not there. I have had batches that have been less fizzy than others, but they are always at least somewhat fizzy. How does it taste? From my personal experience, you will absolutely know if your scoby has died. I remember I accidentally killed mine (not sure how) and when I went to bottle up the ferment the smell was atrocious! If it still tastes like it is fermenting normally then your scoby is still living. Maybe try adding a little extra sugar to the bottle before you do the second ferment? This will help feed the bacteria more and build up carbonation. You can also add some fresh or frozen fruit for the same effect. Let me know how things go! Thank you for all of this information! 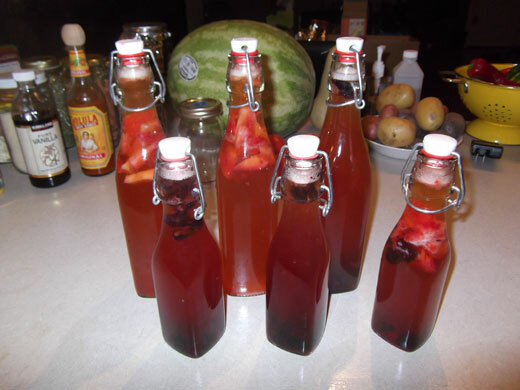 I have been thinking of making my own kombucha, so it is timely! I do have one question: is it possible to replace the cane sugar with honey or coconut palm sugar? I have a sensitivity to it and am concerned about how much sugar will get into my body, even if the Scooby uses most if it. Great blog post. I just ordered my scoby online and will hopefully be making my first batch this weekend. Quick question though. After I’ve completed my first batch and i don’t want to make a second one right away how do I store my scoby? Do I keep it in a bit of liquid from my first batch? Hi Alicia! Yes! That’s exactly what you need to do. I actually recommend brewing up a second batch of sugar tea and storing it in there. That gives it plenty of food to keep it healthy. Some people start what they call a “scoby hotel” where they store them when not in use. You just want to make sure it stays submerged and if you are going to store it for a long time, you will need to feed it some new sugar tea from time to time to continue giving it food to eat. Happy brewing!! Thanks for the article! I just finished the first fermentation and have a question before starting the second fermentation process. After you remove the SCOBYs from the glass jar, do you filter the brew before pouring into the bottles? There is alot of stuff floating around in my big glass jar and I don’t know if that should be poured into the bottles with the brew or if I should filter it out with a strainer? Hi Juliya! Thanks for stopping by. No, I don’t filter mine. I keep all of the floaters in there. Those are pieces of good bacteria and yeast and will actually help preserve your product longer. They will sink to the bottom of the bottle so you could just discard that whenever you’re ready to drink. Or, you can drink it down like I do. 🙂 Hope that helps! !